The Casio Privia PX-160 includes their proprietary sound source, “AiR” (Acoustic and intelligent Resonator) to power the rich grand piano sounds. Giving you the ability to get the sound of a 9-foot concert grand in your home or venue. Lightweight and with great connectivity options, the PX-160 is ideal for all players. The Casio PX-160 features the acclaimed Tri-Sensor Scaled Hammer Action II keyboard. This action also includes simulated Ebony and Ivory textured keys for an incredible feel whilst three sensors capture the dynamics of a performance with exceptional accuracy. Casio’s specially developed Hammer Response feature takes into consideration the speed at which different sized hammers move inside an acoustic grand piano relative to the velocity the keys are played. This provides the ultimate key-to-sound experience in a unit that can be taken anywhere. 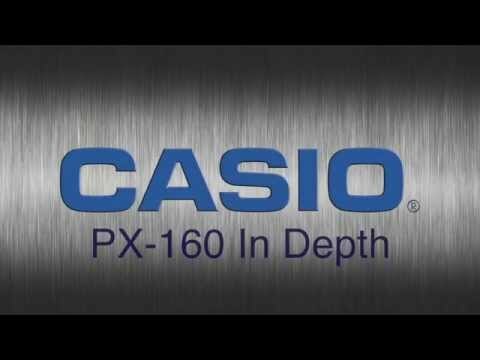 To accommodate a new 8w x 8w speaker system, Casio has redesigned the chassis for the PX-160 to help deliver remarkable sound quality. The speaker system is open to the front but also ported to the back, delivering reflex for a natural sounding piano. Another benefit to this is easy use in a classroom or in a group setting where you may need amplification. The PX-160 also puts rich stereo sounds at your disposal including strings that are wonderful by themselves or layered with the PX-160’s grand pianos, electric pianos, harpsichord and many more. The electric pianos have also been updated providing some dynamic sounds derived from Casio’s award-winning PX-5S stage piano. The PX-160 is capable of splitting and layering sounds allowing you to play bass in your left hand and have two layered tones in your right. Duet mode allows the keyboard to be split into two equal ranges so that a student and teacher can use the same range of the piano simultaneously. A built-in two track recorder can even record and playback your practice and performances one hand at a time which is hugely beneficial to newer players. For quiet practice, the PX-160 now has two headphone outputs which are located on the front of the piano for easy reach and for those who are performing with other amplification such as a mixer or PA system, the PX-160 also utilises 1/4" left and right line outputs on the rear panel. Finally, MIDI and USB connectivity ensures that you can use the Casio Privia PX-160 Digital Piano with your PC, Mac or any other MIDI-enabled equipment.